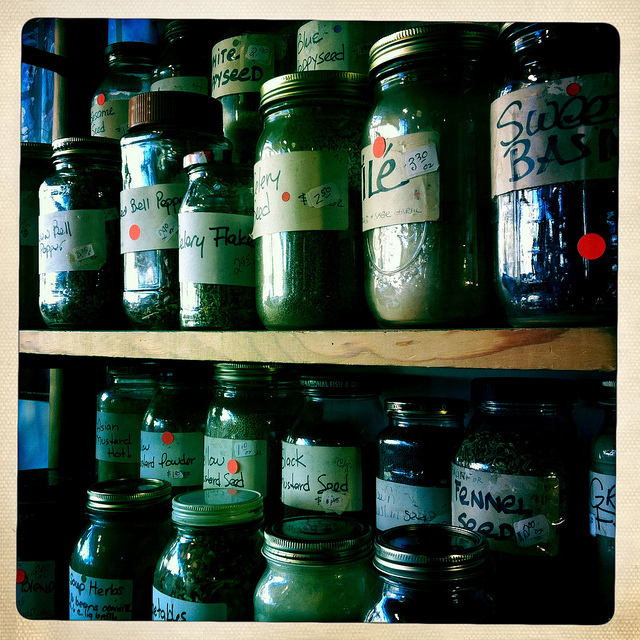 Buck’s Fifth Avenue is a splendid spice store at 209 5th Ave SE Olympia, WA 98501. There website says “We have every imaginable spice” and they told me the same thing in the store. They did indeed have a great selection of spices in hand labeled mason jars and apparently they can get anything else. The joy of the store is that all of the dry spices can be sniffed and most smell wonderful. And you can buy a pinch of anything, which is great for recipes with something unusual. Really, I loved the atmosphere of the store and the outstanding customer service. The owner, Anne Buck, said the store had been around for 43 years. This entry was posted in Olympia, Stores and other places that sell you things, Unique Shopping (stores with some personality), WA State - Thurston County and tagged atmosphere, Buck's, downtown, Fifth Avenue, herbs, mason jars, Olympia, pinch, spice on February 16, 2013 by admin.